Today was yet another travel day. We were up early to have breakfast and be on the bus for an 8am departure. On the bus we watched the movie Inglorious Bastards which is a movie Quentin Tarantino made while on drugs. If only the second world war went down the way he depicted it. Was good entertainment to fill the bus ride. Our lunch stop was in Dresden. After getting off the bus our tour leader gave us a short walking tour then we had around an hour and a half free time. This was also our lunch stop so that is what we all went looking for, food. Krizite told us about a curry place that has really hot curry. We did find the place that she was talking about but it was not a curry as I had expected it to be. It was a saussage with a curry sauce. This is not really what I felt like so a small group of us went to a grill house just across the road. 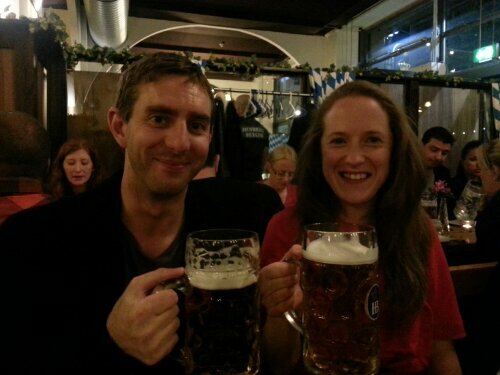 Rhian and I both had enchiladas and I had my first beer in Germany. After lunch there was only enough to time to walk back to the bus. We reached the bus with only a couple of minutes to spare. We were then back on the road to Berlin. We stopped for a short service stop just before we reached Berlin. The bus had to wait an extra five minutes to leave because Rhian had not returned from the toilets but the Brazlian girls were just behind her so they got the watch for being late. When we reached Berlin we went straight into the bus tour. We stopped at Treptower Park which is a memorial to the soviet soldiers killed in the war or conflict. Did not grasp the full explination. After getting on the bus we drove around and saw most of the sights that we would see in more detail on the walking tour tomorrow. We saw what remains of some of the Berlin Wall. I was surprised at how small it was. But you have to remember it was actually two walls and a no mans land in the middle. If you found yourself in the middle you would have been seen by a guard and shot dead. After the bus tour we arrived at the hotel and checked inn. We have another four star hotel so it is quite nice and the WiFi works well in the room this time. 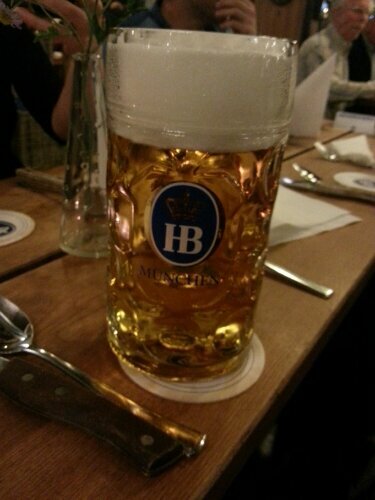 We meet for dinner just before 8pm and the bus took us into town to a german beer hall for dinner. 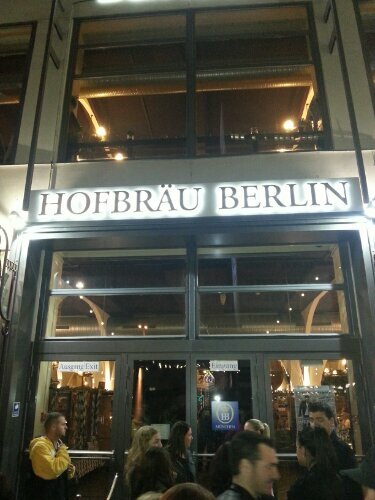 The beer hall was called Hofbräuhaus Berlin and they had the true HB beer. I do not know what the full name is or if HB is the name. Almost everyone in the group had a 1L stein of beer and many photos were taken. 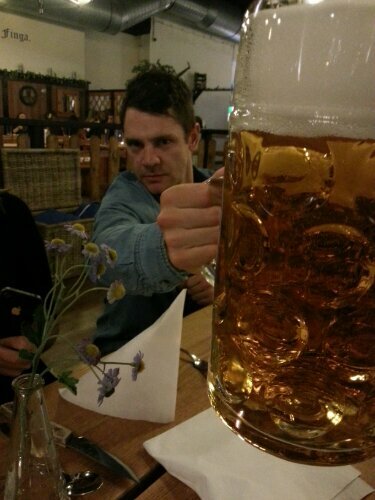 I even bought a propper 1L stein glass to bring home. The entree was some form of vegetable soup and the main course pork knuckle. The meat again was some of the best food we have had on the tour. Loved it. 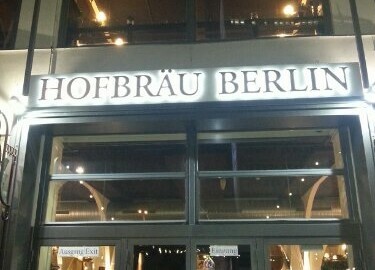 In the little over an hour we were there I had 2L of the awesome golden beer. The bus brought us back to the hotel then we all went out to one of the local bars. We found ourselfs at one just around the corner from the hotel. It was empty before we got there and so only had one girl behind the bar. We pretty much took over the place. Rhian and I only stayed for one drink because I want to save myself for the pub crawl tomorrow night. I am sure the next blog will be interesting and probably a long one.